Lock in a great price for Grajagan Surf Resort – rated 8.8 by recent guests! The facility is beautiful and very well maintained. The staff is super friendly and helpful and organized a special dinner for the 50th birthday of my wife. On a rainy day we were given umbrellas. Some of the staff speak English, some Spanish. Grajagan Surf Resort This rating is a reflection of how the property compares to the industry standard when it comes to price, facilities and services available. It's based on a self-evaluation by the property. Use this rating to help choose your stay! 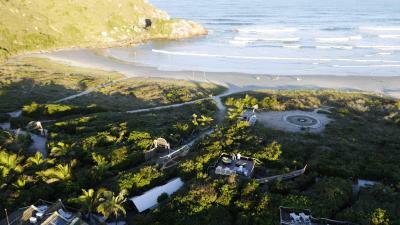 Right on the white sands of Grande Beach, this surf resort is set among rich Atlantic Forest. The guest house offers a bar and a restaurant. Featuring a balcony with views of the surrounding gardens, rooms at Grajagan are equipped with air conditioning, a bathroom, TV and mini-bar. The duplex chalets also provide sea views. The restaurant features wooden fittings and rustic-style furniture. It serves buffet breakfast with fresh fruits, plus tasty regional specialties for lunch and dinner. Praia de Fora Beach is located 350 feet from Grajagan Surf Resort, and Farol das Conchas Lighthouse is 650 feet away. 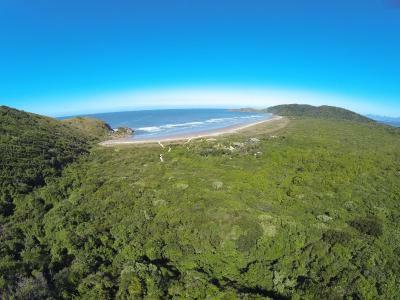 뀐 Located in the top-rated area in Ilha do Mel, this property has an excellent location score of 9.3! When would you like to stay at Grajagan Surf Resort? Featuring a balcony with views of the surrounding gardens, this room offers air conditioning, a modern bathroom, TV and mini-bar. WiFi is free. Featuring a balcony with sea and garden views, this duplex chalet offers air conditioning, a modern bathroom, TV and mini-bar. WiFi is free. Featuring a balcony with views of the surrounding gardens, this larger room offers air conditioning, a modern bathroom, TV and mini-bar. WiFi is free. Featuring a balcony with sea views and a hammock, this room offers air conditioning, a modern bathroom, TV and mini-bar. WiFi is free. House Rules Grajagan Surf Resort takes special requests – add in the next step! All children under 12 years are charged BRL 90 per night for extra beds. Grajagan Surf Resort accepts these cards and reserves the right to temporarily hold an amount prior to arrival. Please note, some rooms may not accommodate children. Please contact the property to verify extra bed availability and prices. Please inform Grajagan Surf Resort of your expected arrival time in advance. You can use the Special Requests box when booking, or contact the property directly using the contact details in your confirmation. A little bit more variety at breakfast would be nice. Nothing, was all really great! Waiters not helpful, very poor breakfast (missing lots of things). Clean, cozy and great value for money. Its expensive for the structure, no pool, no jacuzzi and the room is small for the price. A shame about the breakfast. No milk, No Coffee, no cheese bread out....everything was missing, and the restaurant was only open 30 minutes. VERY POOR. Location and facilities were wonderful.